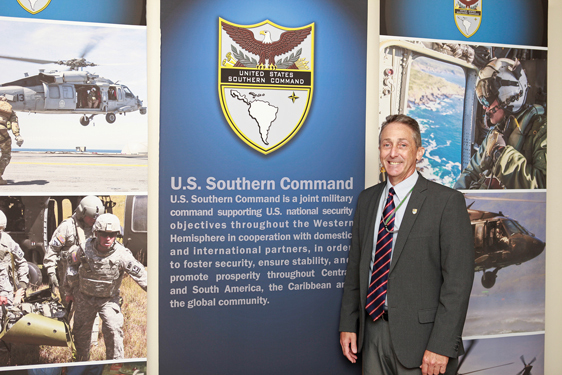 The US Southern Command, which moved its headquarters to Doral from Panama 20 years ago this month, has amassed a combined economic impact in Miami-Dade of 53,151 jobs, $5.4 billion in sales, $5.1 billion in gross regional product and 4% of total gross product since 2011, according to the Bureau of Economic Analysis. The command is one of nine unified combatant commands in the Department of Defense. Its economic impact is combined with that of the National Guard, Coast Guard and other combined direct defense expenditures. A descendent of US military units dispatched to Panama in the early 20th Century, the US Southern Command’s history as a unified military headquarters began during World War II, when US planners established the US Caribbean Defense Command, according to its website. During the 1950s, the command’s responsibility shifted from US military missions in the Caribbean basin to operations focused primarily in Central and South America. Then, in September 1997, US Southern Command moved here with revised priorities, objectives and capabilities, such as providing contingency planning, operations and security cooperation in its area of responsibility, which now includes Central America, South America and the Caribbean except for US commonwealths, territories and possessions. As a result of its revised priorities and objectives, the Southern Command was awarded $237 million by the Senate Appropriations Committee to construct its current 709,000-square-foot headquarters at 9301 NW 33rd St., Doral, after an ongoing search for a permanent headquarters in the early 2000s. Now, seven years after moving into its permanent headquarters, the Southern Command is responsible for employing more than 1,200 military and civilian personnel representing all branches of the US military and numerous federal agencies. It has played a major role in shaping all military employment in Miami-Dade since 2012. As a result, earnings are a proxy economic impact measure, which are inclusive of more than simply income, according to spokesperson Raymond Sarracino. As a result, the county’s combined direct defense expenditures totaled over $1.2 billion in 2011 through procurement, which accounted for $486 million, or 39.1% of the $1.2 billion total, along with salaries, which accounted for 34.5%, and transfers, which accounted for 26.5%.